In the past year or two, the Cranbourne/Pakenham rail line has seen numerous upgrades to prepare for the High Capacity Metro Trains to start this year. Some of the upgrades are to power systems. 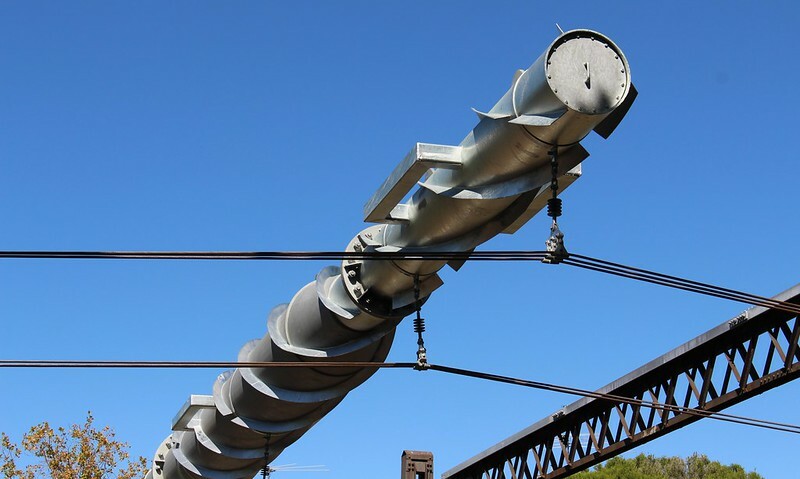 I’m not normally one to write blog posts about new items of infrastructure, but have you seen these bad boys installed near Armadale station? 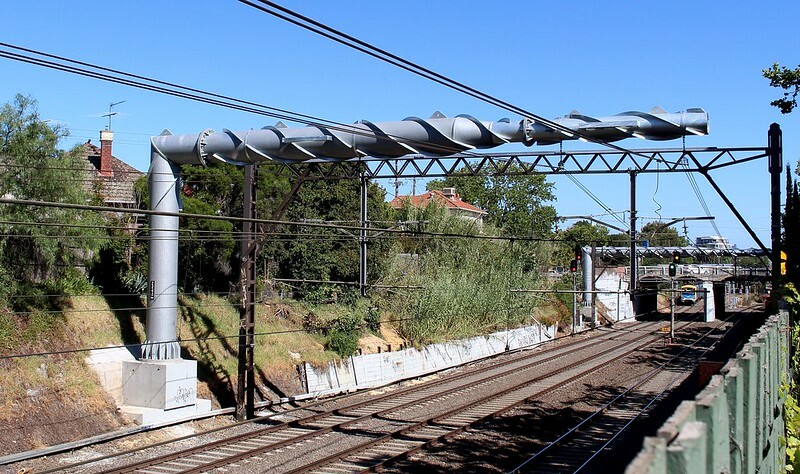 Not your average overhead wire stanchions. There are two of them. It appears they’ve been used because there’s a lack of space on the north side of the rail lines just east of Kooyong Road. EDIT: I’m told there’s a third near Chapel Street in South Yarra. Apparently the distinctive spiral design is to keep the structure stable in the wind. They’re quite impressive. Keep a lookout if you’re going past. 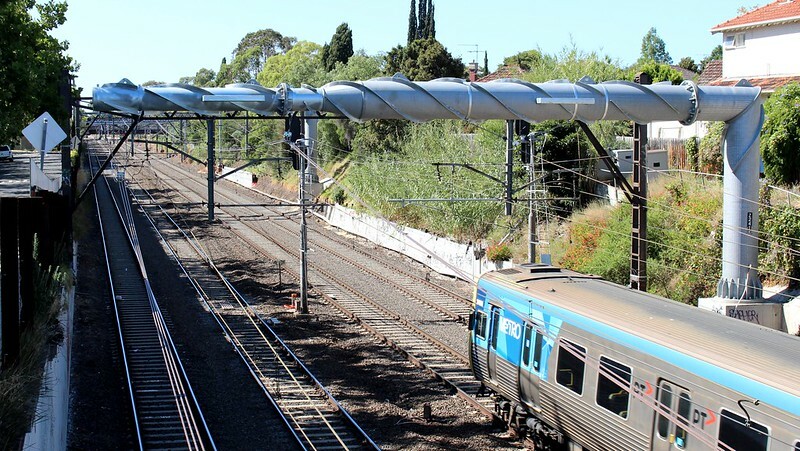 And expect to see similar power upgrades on the Sunbury line in the coming years to prepare for trains to be through-routed from Cranbourne/Pakenham via the metro tunnel out to Sunbury. There’s a whole Reddit thread about these. I’m sure that the engineers have calculated the forces at work in those right-angles (in these structures as well as many others forming part of the upgrade), but they look challenging to my non-expert eye! I wonder if they will last 100 years as have the structures being replaced. And perhaps less margin for error if there are any flaws in the construction process? Maybe Dan is saying screw you.. :) Spiral is to stop vibration of horizontal cantilever in vertical directon from wind up and down track. Typically spiral height is 0.1 times diameter at about 1 diameter pitch or thereabouts. Usually only a problem if fundamental frequency of vibration is less than 1Hz. I went away on holidays and came back to find these monstrosities near my house. The local residents weren’t told what these were for so I have no idea. Funny how my house lies in a heritage overlay so I can’t do anything to the outside appearance to modernise it but Metro can do what it likes. They look like they belong on the set of The Thunderbirds, not as part of rail infrastructure. It’s not just these that are ugly, it’s all the new overhead supports. Big, thick, boxy things that cantilever over the tracks. Why can’t we have the elegant designs they use in Germany or Switzerland, as can be seen in videos like this?